There are many causes of dog joint pain, from hereditary degenerative problems like hip dysplasia, to physical injury to the joint. But the most common is canine arthritis. Before we talk about the various diseases and injuries that can cause your dog joint pain, let's talk about the anatomy of a dog's joint. 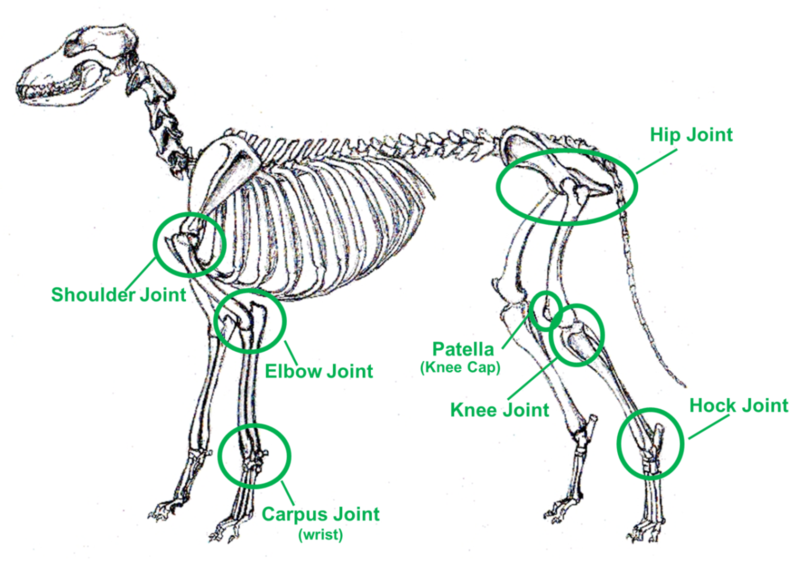 Dogs have 6 major joints in their body, 3 in the front and 3 in the rear. The picture to the right (click to enlarge) shows the 6 major joints in a dog's legs. Inside all of these joints is a lot of fluid and soft tissue, such as cartilage which protects the bones from rubbing against each other. And synovial fluid that fills the whole joint socket and lubricates the cartilage. Then there's the connective tissues, such as tendons which attach muscles to bones. And ligaments which attach bones to bones. These keep the joints stable and make it so they can move and flex like they're supposed to. Damage to any one of these parts can cause your dog joint pain - So let's talk about some of the most common problems. Arthritis in dogs is unfortunately all too common. It's usually associated with old age, but according to statistics, about 65% of dogs over 6 years old show signs of this debilitating and painful disease. Regardless of the specific type, arthritis is truly horrible and painful. Even a minor case can cause your dog misery. The most obvious symptoms that your dog has joint pain caused by arthritis are limping, and stiffness - especially after laying down for a while. The real tragedy for your dogs joint pain caused by arthritis, is the conventional drugs used to treat it. Actually, conventional drugs don't even treat the actual arthritis, they only attempt to lesson the pain. Pain relief is a noble concept, but unfortunately the drugs don't work very well - and they cause more damage to your dogs body. If you really want to help your dog's joint pain, you should learn more about natural dog arthritis treatment. Hip dysplasia in dogs is one of the worst causes of dog joint pain. It is hereditary, and passed from parents to puppies - A dog with hip dysplasia should NEVER be bred. This is one cause of joint pain that can absolutely be prevented by responsible breeding. Hip dysplasia happens when the hip joint isn't formed right. The ball and the socket that make up the joint don't fit together like they're supposed to. The hip socket isn't as deep as it should be, and the ball that's on the end of the leg bone (femur) isn't as round as it should be - The result is almost like trying to put a square peg in a round whole. That means the joint doesn't turn and spin and slide like it should. The only way hip dysplasia can be prevented it by not breeding dogs that have it - But if your dog does have it, is there anything you can do to help? Click the link above to learn more. Luxating patella in dogs - That's quite a mouthful. . . The patella is another word for kneecap. Your dog has a kneecap just like you, and it sits in a little groove on the end of the femur bone. It helps guide the quadricep muscle (like your thigh muscle), and protects the knee joint itself. The word "Luxate" means to dislocate, or move from it's normal position. A dog's knee will luxate when that little groove is too shallow - The shallow grooves let the knee cap slip sideways. When the knee cap slips out of the grooves, it locks dogs leg in an un-natural position, which causes a lot of pain. Click the link above to learn more. The cruciate ligament in dogs is located in the knee joint, which is in the back legs. There's actually 2 ligaments inside the knee joint, they're called Anterior and Posterior. These ligaments make the knee joint work like it's supposed to. The Anterior ligament is in the front of the knee joint, and the Posterior is in the back of the joint. Unless there is a very severe injury, it's usually the Anterior ligament that gets damaged. When the ACL (Anterior Cruciate Ligament) causes your dog joint pain, it's because if one of them is damaged, the two bones (femur and tibia) stop moving together, and instead they can move independently. In other words. . .The joint doesn't work like a joint anymore. The most common causes of injury are slipping, falling or otherwise twisting the back leg. My boy Chevy turned suddenly, when confronted by another dog, and that was enough to tear his ACL. The usual treatment is surgery, by replacing the ligament with synthetic material. However, there are other less invasive ways to treat it as well - Click the link above to learn more.